Impressive western cowboy boots from Grinders! The womans Maverick is a stunning full leather western cowboy ankle boot from Grinders. 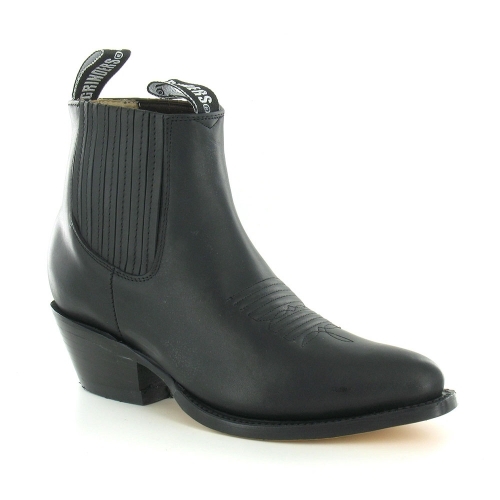 Premium quality, oily full black leather uppers are just the start of this superb ankle boot! Featuring an elasticated topline and side panels for easy fitting, intricate stitching detail over the toe and instep, and a genuine leather sole for greater durability. The style of the boot is completed to perfection with a low 5cm (2 inches) heel. The Maverick leather western cowboy ankle boot from Grinders is nothing short of impressive!